ruthdelacruz | Travel and Lifestyle Blog : My Amazing Race Experience with Skechers GoWalk Shoes! My Amazing Race Experience with Skechers GoWalk Shoes! It is not everyday that you can run around Glorietta Mall, walk like a model and bounce with joy while playing one of the most exciting games that tests the wit, speed and endurance of the players - Amazing Race! We got the license to do it last week as Skechers put our GoWalk shoes to real test with the Snap N' Bounce Challenge! When I received the invite from dear Martha and she noted that we needed to prepare for the challenge, it didn't occur to me that the event would be like an Amazing Race! I was feeling lazy, injured and sore (it was the time of the month!) - and I thought I would not join the challenge and just go to support the event. I came unprepared but I just bought my Skechers Go Walk anyway.. When I came to the venue, I saw my blogger friends preparing for the race and choosing their own Go Walk Shoes! Ok, I have decided to put the game face on! Even if I was feeling injured (and wearing a tight skirt! Haha), I have confidence in my new Skechers Go Walk shoes! When this picture was taken, I said "the winning team"
Click Read More to read about my review.. The challenge was to complete the tasks and get the mission cards from different spots in Glorietta. When Skechers signalled the start of the game, everyone went running except for our team who enjoyed walking on our way out of the store to Landmark where we completed the first task - take a picture of something plush-y. the Skechers Go Walk and get the next mission card in the fountain area of Glorietta 4. It helped that know our way around the mall! Coffee Bean and UCC Coffee! We crossed the streets, ran and went wild! killed in this game! But it was exhilarating whenever you see the other team! feel so comfortable. I could only complain about my dysmenorrhea! Mission: Take a picture showing your dream destination! Oh, we all want to go to UK! I seriously want to go back to London! Back to the Skechers Store - we did a quick styling and it was announced - we won! Woot! If you have big shoe size (like me) it is always hard to look for a pair of shoes that fits! Oftentimes, you just buy whatever it is that fits and you end up hurting yourself for the first few times you would wear your shoes. The shoes would then feel comfortable after hundreds of band aids and callouses. 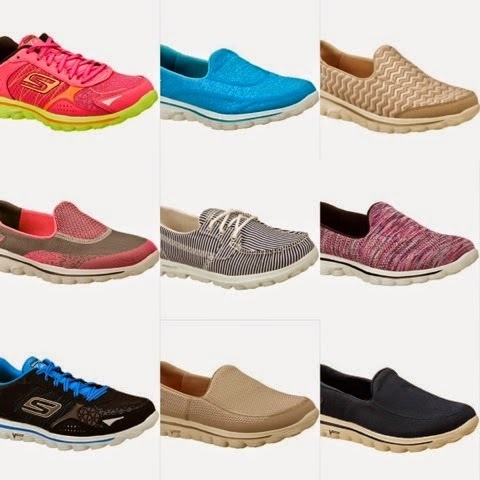 It was not the case with Skechers GoWalk shoes. It was my first time to actually use the pair for real walking (I just initially used it for a photoshoot where I also jumped and bounced!). I totally abused the Skechers Go Walk (or abuse my feet) by walking, running and bouncing around the mall. My feet just sit perfectly inside the shoes, and Skecher GoWalk feel light that it seems like it was following my feet's movement. The day after the Skechers GoWalk Snap N' Bounce event, we could only complain about sore calves and thighs, but not sore or calloused feet! Thank you so much Skechers and Martha for having me! I cannot wait to get another pair! Now which one to choose? © ruthdelacruz | Travel and Lifestyle Blog : My Amazing Race Experience with Skechers GoWalk Shoes!